Contribution To A Better World !! An Introduction and "The Alpha-Phonics Song !" Was created to provide parents, teachers and tutors with a sensible, logical, easy-to-use system for teaching reading. It is an intensive phonics instruction program based on the author’s many years of research and experience in the reading instruction field. It answers the need for a practical instruction program that anyone who wants to teach reading can learn to use with no special training. 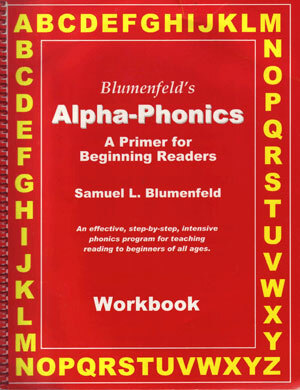 The Workbook teaches our alphabetic system – with its 25 letters and 44 sounds – in the following sequence: First, the alphabet, then the short vowels and consonants, the consonant digraphs, followed by the consonant blends, and finally the long vowels in their variety of spellings and our other vowels. This program can be used to teach reading to beginners of all ages, older students in need of remediation, non-readers, adults who wish to improve their reading skills, dyslexics, the learning disabled, and non-English speakers who wish to learn to read English and improve their pronunciation. It can also be used as a supplement to any other reading program being used in the classroom. Its systematic approach to teaching basic phonetic skills makes it particularly valuable to programs that lack such instruction. All of the lesson pages were carefully designed to eliminate distraction and help the learner focus his of her attention on the work at hand. The program, as a whole, is flexible enough so that any parent, teacher, or tutor can adapt it to his or her own teaching style or situation. If you have never taught reading before in this sensible, systematic way, you will be pleasantly surprised by the results. Watch the introduction above and Sam's video in three parts below. It is intended to go along with the "Workbook" . An Excellent Reading System . Give It A Try !!! "If Jesus Christ Offends You; Wait Till You Meet Lucifer ! !